"The challenge of modernization through 'rip and replace' is somewhat akin to attempting to change the wiring in a house while the power is still on." Facing a growing tide of information chaos, organizations must embrace much more modular and flexible content services strategies and platforms. However, ripping out existing systems that perform mission critical functions in order to “modernize” is not something an organization operating at significant scale can approach cavalierly. The challenge is somewhat akin to attempting to change the wiring in a house while the power is still on. Content migration and integration technologies provide a bridge allowing organizations to manage this change. Doing so allows them to continue to leverage the value of past technology systems and investments, maintain business and process continuity, and also simultaneously embark upon needed change and modernization. What specific business problems are driving interest in content migration and integration? How well-understood are the solutions to solve core content integration and migration problems? 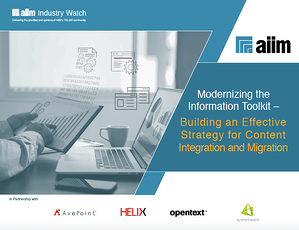 How are end user organizations prioritizing their spending options in order to modernize their information toolkit? AvePoint, Inc., Helix International, OpenText, and Systemware, Inc.